This critical exposition of Adam Smith’s Theory of Moral Sentiments, first published in 1971, gives an appreciation of Smith’s conception of scientific method as applied to the study of social phenomena. The work is placed in the context of Smith’s other writings including of course The Wealth of Nations, but making special use of the theory of scientific development contained in his posthumous work, Essays on Philosophical Subjects. 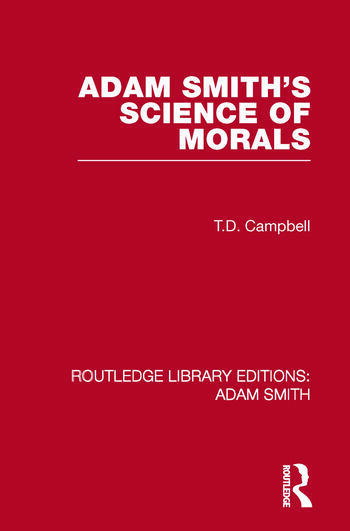 By concentrating on Smith’s methodological approach to the study of society, this book provides an illuminating interpretation of his moral theory and defends it against any mistaken criticisms. It also includes a much needed analysis of the important differences between Smith’s ‘impartial spectator’ and the ‘ideal observer’ of modern ethical society. The result is a pointed study, bringing out the close connection between his moral, legal and ethical theories, which will be welcomed by all students of 18th century thought, specialists in moral theory, and the interested lay-reader.